Are you a property owner looking to protect your vehicles or belongings with a high-quality structure at an affordable price? Carport Central has what you are looking for. We carry an outstanding selection of custom steel buildings, metal carports, and North Carolina Carports to safeguard your valuables for years to come. Our products are backed by warranties, and there are many customization options available to you so that you can purchase the perfect metal building to suit your needs or stylistic tastes. All North Carolina Carports comes in different sizes to better meet your unique needs. Additional options and a variety of colors are also available. Do you want a customized enclosed steel carport? we can do that. 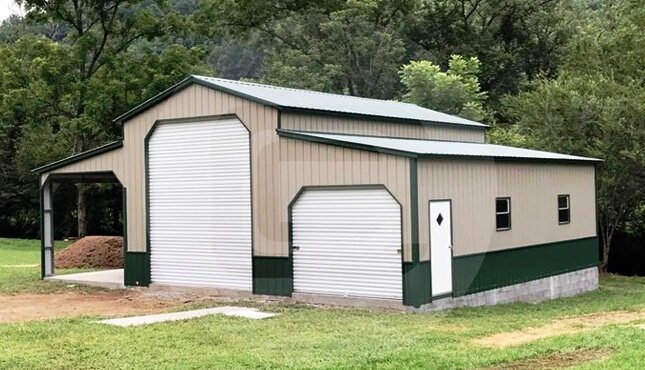 In fact, we have a nice selection of fully enclosed steel garages and metal barns to choose from that can help you protect anything from vehicles to horses. Many people have found that our metal buildings are useful for more than just sheltering items, as people have used our metal barns, garages and carports for office space, workshops, outdoor pavilions, etc. Carport Central can help you meet all of your storage and utility needs. Regular Roof Style Carports – feature roofs with rounded edges. This classic style sports corrugated ridges that run horizontally from end to end and is best suited for protecting vehicles in climates that feature a lot of sunshine but infrequently experience strong winds or heavy rainstorms. Boxed Eave Style Carports – incorporate an A-frame design that also has horizontal panels running from front to back. Boxed Eave roof comes with beauty and is economic than vertical roof. This is an ideal roof for areas that are particularly windy but lack an abundance of precipitation. Vertical Roof Carports – offer the most protection for automobile owners in areas that do experience strong winds as well as heavy rains and snowfalls. The vertical panels on these roofs provide an advantage over the other styles because the vertical corrugated ridges effectively channel the precipitation off the side of the structure. As a result, less water can get caught on top of the roof.